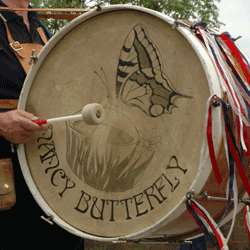 Nancy Butterfly were formed in 1980. We dance in the North-West Morris tradition. This is a style which is both exuberant, energetic and keeps you fit! 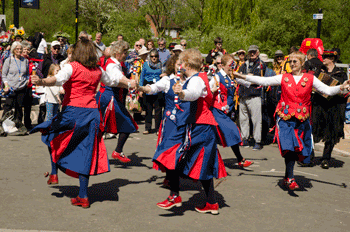 Amongst the many things which distinguish it from the other Morris traditions are the distinctive clogs which can be seen and heard during our performances! NB. We are always happy to welcome new members! Dancers and musicians are welcome, the main qualification needed is enthusiasm! Practices currently take place on Monday evenings at the Avoncroft Art Centre, Stoke Heath Bromsgrove (map here). They are ongoing (times and dates HERE)- or contact us for details. It is a good idea to check if we are practicing, as during the 'season' we try to arrange 'Dance Outs' with other sides at different venues. We are members of the Morris Federation. See the original sketch map by Norman Neasom RWS, RBSA, (from which the name 'Nancy Butterfly' was derived). OUR DANCES There are several types of Morris Dancing. 'Cotswold' is the tradition that most people will be familiar with, but there are others such as 'Border', and 'North-West' the one we follow. Our dances derive from the North-West Morris tradition based mainly around industrial Lancashire and Cheshire. Some are traditional, some our own. In those dances which we have developed ourselves, we have maintained the tradition of naming the dances after the places where they were performed. (Many of them now locations for traffic jams on the M6! - Knutsford, Holmes Chapel etc...) So 'Crabb's Cross', for instance originates in the area of Redditch in which we practiced for many years. Morris dancers in the North-West used to accompany a 'Rush Cart' to the village church at the annual 'wakes week', processing through the streets. The team danced along and stopped now and then to do a figure. Because of this, the 'chorus' in North-west dances is frequently called 'up streets'. The dances performed tended to follow the same pattern but the figures, arm movements, etc. would vary. The music is based around several traditional tunes. Often, two tunes are used for a dance. Originally the music would have been provided by local brass bands. Nowadays it is usually played on melodeons, accordions, fiddles and guitars, and an occasional brass instrument, whilst the rhythm is kept by drums and a variety other 'percussive instruments'!